Well, then it's an especially good time for me to be "worshipping" God as I find myself between jobs unexpectedly and thus my main channel of financial income gone. Due to an organizational restructuring, the work contract I had that was to last one year has now ended after 7 months. I'm grateful for the two weeks' notice, i.e., 2 weeks of pay I would not have received. Still, I have to say that I've never been given 2 weeks' notice - well, any notice for that matter - in my entire career! I'm ready for a corporate break so I guess God did for me what I could not do for myself (quit!). While job hunting is at least a full-time endeavor, this time around I'm doing it differently - especially since I feel like a kid who's been released for summer break! I'm including more time for me, my physical, spiritual, mental, and emotional well-being. I plan to practice yoga more frequently, get back into water aerobics, continue with my SharePoint and Visio learning, dive further into studying Naam Yoga and Universal Kabbalah, create new relationships and nurture existing ones, and who know what else?! As I've said for many moons, who even has time for a job?!!! It could also be an especially opportune time to really explore what work would nurture my spirit while I am of great service to an organization that appreciated it and me, and could provide good financial compensation. And so too, I plan to spend more time "worshipping" Spirit: strengthening my trust, seeing the Presence more and more around me, and talking (praying) to and listening (meditating) to Spirit. Change, change, change! It's never ending. This here Life on planet earth is an adventure - if I choose to view it that way. And, oh, if you're so inclined, for additional reading "pleasure," I've attached my latest resume in case you hear of a role that might be a win-win for all parties. Thanks. 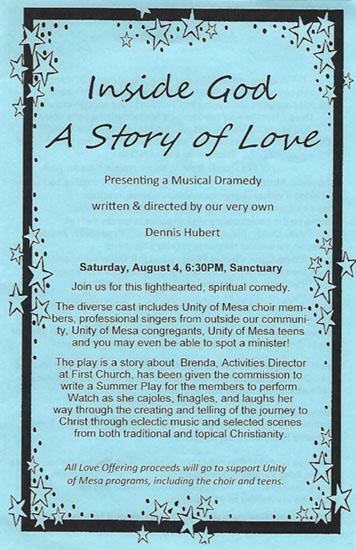 If you're going to be in the Phoenix, AZ area, nourish your soul with inspirational musics and lyrics by attending Dennis Hubert's lighthearted, spiritual comedy "Inside God: A Story of Love." Click here to read/print a flyer with more details. 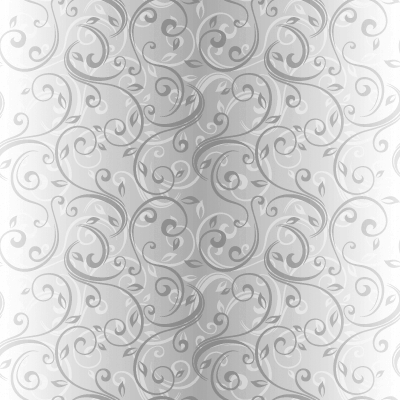 their true beauty is revealed only if there is light from within." I told someone about my schedule getting freed up a bit for a while now that I'm between work contracts and she said "Enjoy your free time!" I initially caught a little bit of an attitude, thinking "does she not know that looking for a job is a full-time job, so it's not that I'm going to have all this free time - I just won't be going to an office and will have more flexibility in my schedule, but I'm still going to be busy..." and yadda, yadda, yadda. But I knew what she meant, and appreciated her good wishes. And, I got to contemplating the phrase "free time"... Is there really such a thing? Michael A. Singer's chapter "Contemplating Death" in his book " An Untethered Soul" speaks about how life belongs to death. "Death is the one who comes in his own time to take life from you. Death is the landlord and you're the tenant. Death is the one who comes to claim his property because it has always belonged to him. You should have a healthy relationship with death, and it should not be one of fear. Feel grateful to death for giving you another day, another experience, and for creating the scarcity that makes life so precious. If you do this, your life will no longer be yours to waste; it will be yours to appreciate" (page 163). And so, is time really "free?" It just IS, by the nature that I'm still alive and breathing. How I label it or judge it makes no never mind as ultimately, I will "run out of it." In the meanwhile, it is mine to use to make as rich a life experience as possible, moment by moment. And that's what counts. Everyone is familiar with how stormy weather can put a real crimp in plans and be frustrating, even downright disastrous. Read about the kindness of not just people, but total strangers who helped make an event even more special and meaningful than had originally been planned. Gonzalez, 24, watched from inside her parents' car June 30 as thick raindrops tore at her fairy tale nuptial setup - drenching the rows of white folding chairs set up on the sand, the flower-crowned altar inscribed with her initials and those of her fiancé and the petal-strewn white carpet down which she was supposed to walk. "I was trying to hold my tears," Gonzalez said in an interview with The Washington Post this week. "I'm about to have a panic attack, I'm asking my mom, 'What am I gonna do?'" I trust you are enjoying the summer. It's difficult to believe that August is upon us, but it's also comforting: we know that we are getting closer to the more bearable temps, especially here in the Southwest!